It is always very satisfying when another piece of the genealogical jigsaw puzzle slots into place, and this is what happened following the item I wrote last time about Robert Fotherby, who gave his body to science. I already had a copy of his Will and decided now was the time to transcribe it and to remind myself why I knew anything about him in the first place. I had in fact come across him in the Will of John Rose of Cotterstock (c.1696-1736), which is one of those documents that is a real treasure trove. John Rose had no children and left a number of legacies to his cousins before making over his estate which included holdings in Jamaica to his nephew, then a minor, on condition that he change his name from John Pate to John Pate Rose – which in due course he did. He listed the following cousins – Robert Fotherby and his wife Frances; Mary Stileman; Martha Milner; Thomas Bush; Thomas Pain the Elder of Oundle, and his sons John and Thomas; Rose Fuller and Francis Sadler both of Jamaica; and the widowed Mary Smith of Leicester. He left a number of charitable legacies and money for his servants as well as, intriguingly since I don’t know what the connection was, Fifty pounds to be equally divided between the two Sons of Thomas King late of Spanish Town in Jamaica aforesaid Dancing Master deceased to be paid them in Jamaica money. Whether John Rose had ever visited his estates in Jamaica, which were being managed by Francis Sadler, is not recorded. You can read the Will in full here. To unpick all these relationships we need to go back to the early days of settlement in Jamaica when the sons of Thomas Rose of Mickleton decided that their future lay there. The eldest brother William, an apothecary, remained in London acting to some extent as family banker; Dr Fulke Rose and his brothers Thomas and Francis patented land in Jamaica; John Rose pursued a career as a merchant based mainly in London, trading goods and convicts into the island (although one of his daughters was born in Jamaica). There was also a sister Elizabeth Rose, possibly married in 1679 to Richard Phelps in Jamaica, and later to a man called Milner, finally in 1699 back in London to a widower called William Bush with whom she had several children. So we can de-code the cousins of John Rose of Cotterstock, whose father was William Rose the Apothecary, as follows: Mary Stileman was a daughter of John Rose the merchant and you can read more about her here. Her son from her second marriage was Francis Sadler. Martha Milner was a daughter of Elizabeth Rose, and Thomas Bush was Martha’s half-brother. Rose Fuller was a grandson of Fulke Rose and as a young man he went to Jamaica to manage the estates belonging to the Fuller and Isted families. That was as far as I had got until I looked again at Robert Fotherby and discovered a marriage licence allegation on Ancestry for an intended wedding to the widowed Frances Charnock ‘aged upwards of thirty years’, in 1732. Frances Rose had buried her daughters Elizabeth and Mary in the parish of St John Jamaica in August and October 1720, and her husband Dr John Charnock in September ten years later. Their deaths are recorded in a monumental inscription (Lawrence Archer, p.313). Returning to England she remarried and had, it is to be hoped, ten happy years with Robert Fotherby. That he was very fond of her is evidenced by the care he showed in providing for Elizabeth Lambe, who had been her companion, and perhaps her nurse in her last illness. 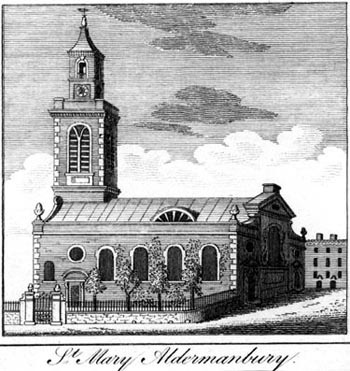 Frances was buried on the 2nd of March 1741/42 at St Mary Aldermanbury in the City of London, where her mother Elizabeth had been buried in 1735 and her infant niece Elizabeth Serocold (daughter of Martha Rose) was buried in 1716. The church was destroyed by enemy action in 1940, but in 1969 when the site was to be redeveloped the stones were sold and the church was rebuilt in Fulton, Missouri, USA as the National Churchill Museum. So of this extensive list of cousins, all apparently relations of the Rose family, I am left with Thomas Pain and his sons who I suspect were closely related to John Rose’s wife Elizabeth (one of the witnesses to her Will was a Thomas Payne) and Mrs Mary Smith of Leicester. I did not hold out much hope of finding Mrs Mary Smith though my guess is that she was also a member of the Pain family. However I then discovered that in 1758 the Bank of Smith and Payne was established in London’s Lombard Street. John Payne, the founding partner, and a Chairman of the East India Company, was a nephew of the Thomas Payne of Oundle mentioned in the Will of John Rose of Cotterstock. Both the Smith and Pain/Paine/Payne families had connections with Wigston near Leicester. John Paine of Oundle, son of Thomas the Elder, was buried in the church of St Peter, Oundle on the 23rd of July 1801, aged eighty-one, at which time his younger brother Thomas and sister-in-law Sarah were still alive. As a postscript: John Pate did obtain a private Act of Parliament in 1744 to change his name to John Pate Rose. He went on to have three daughters with Martha Henn, but I am not clear whether he was married to her. Hannah Bella born in 1753 died young. His daughters Letitia and Sophia born in 1751 and 1752 both married within a month of each other in 1784, each couple being witnesses at the others’ wedding – Letitia to the widowed Sir George Booth and Sophia to the Astronomer Royal Nevil Maskelyne with whom she had a daughter Margaret.